Fairy Haven is abuzz with news about its latest arrival, Prilla. It's bad enough that she has no idea what her special talent is, but some of her behavior is remarkably, well, human. Prilla is heartbroken that she does not seem to fit in. 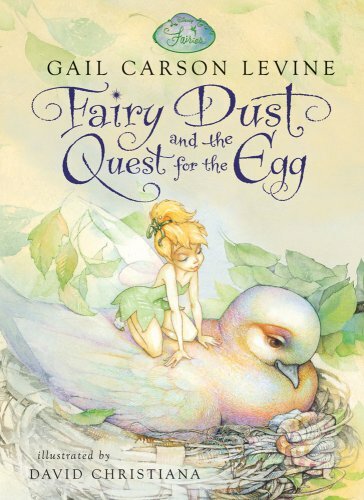 She desperately needs help from Mother Dove, the most important creature in Neverland, who created and cares for the magical egg that prevents all who live in Neverland from growing old and dying. But tragedy strikes as the island is hit by a hurricane, and the Never egg is destroyed. Mother Dove must pick three fairies to set out on a dangerous quest to repair the egg. She chooses Rani, the best water-talent fairy; Vidia, the most selfish, but fastest fast-flying-talent Fairy; and, to everyone's surprise, Prilla. The three embark on a journey filled with danger, sacrifice, and adventure. In the beginning of the book we learn that a baby's first laugh becomes a fairy. I love this. I have 2 younger brothers and I remember each time they had their first laugh. I wonder if it made a fairy? Here's 3 things I liked about the book: first, I like that it's about fairies. They each have a special talent. The second thing I liked about this book is that you get to meet a new character, Mother Dove. She's not in any of the movies and she's so important. The third thing I liked is that the story felt so real. And the illustrations are gorgeous! I also loved that the fairy Prilla thinks that a kid (they are called "clumsy's" to the fairies) is a fairy! Pick yours up at the bookstore today, you're going to want to buy this one. Bye,see you next Thursday! LOVE this one! And the author is AMAZING! I've never read these books, but my daughter ADORES them. She's obsessed with fairies! 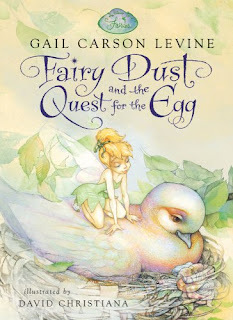 I prefer the Disney fairy books over the Rainbow Fairy books because 1) they're written by Gail Carson Levine (awesome! ), and 2) absolutely gorgeous illustrations. You should check out In The Realm of the Never Fairies: Secret World of Pixie Hollow. It's a gorgeous book (a bit like an atlas) about Pixie Hollow and all of the fairies from the books.